This will be our third and final episode about the American led Meuse-Argonne offensive. We will cover the entire month of October and then the beginning of November, right up to the armistice. During this time the French and Americans would continue to launch attacks in the Meuse-Argonne region with somewhat limited success until November. The Germans would also continue to defend, and would be successful for all of October, although in these defenses they would slowly lose more and more men to simple attrition. Events elsewhere, which we will cover in later episodes, would eventually mean that the war would end just as the Meuse-Argonne operation was starting to have something that could be even sort of described as a success. The next two episodes 174 and 175 will look at these events on the Western front during the time. This will be our third and final episode about the American led Meuse-Argonne offensive. We will cover the entire month of October and then the beginning of November, right up to the armistice. During this time the French and Americans would continue to launch attacks in the Meuse-Argonne region with somewhat limited success until November. The Germans would also continue to defend, and would be successful for all of October, although in these defenses they would slowly lose more and more men to simple attrition. Events elsewhere, which we will cover in later episodes, would eventually mean that the war would end just as the Meuse-Argonne operation was starting to have something that could be even sort of described as a success. The next two episodes 174 and 175 will look at these events on the Western front during the time. We start this episode with the American and French attacks that would begin on October 4th, thefirst real effort made after the offensive had been paused in late September. October 4th would be the beginning of the second phase of the Meuse-Argonne operation. On the third Pershing had visited all of his Corps commander and he took with him a simple message, drive forward at any cost. However, when the attack actually got going, it once again would develop quite poorly for the American attackers. The 77th division would not really get anywhere on the left, the 28th in the center would not take its primary objective of Le Chene Tondu, and it was only on the right where real progress was made. Here the 1st division had advanced several miles on the 4th and this would continue on the 5th. With this advance the original goal of outflanking of the Argonne looked like it could actually become a reality. Outflanking the Argonne had been an objective for the very first day of the attack, so it was only about a week late. Pershing would write about these attacks that “Attack resumed at 5:25 this morning. Met durable resistance, advance very slow. Our men have had to fight for every 100 yards they have gained, and it looks as though we will have a hard, slow advance. There is no course except to fight it out, taking the best possible advantage of the ground which now lays to the advantage of the Germans.” General Gallwtiz would believe that it was not the terrain that stopped the Americans but instead the bravery and determination of the German defenders. He would write that “under the brave and obstinate resistance of our infantry and the performance of our artillery.” Even though the German troops in the Argonne were now outflanked from the east, Gallwitz had no intention of just giving up the Argonne like Pershing expected him to do, so the Americans would have to figure out a way to push them out. On October 6th General Liggett, who commander the American First Corps, saw an opportunity to give the Germans that push. With its advance the previous days the 1st division had created a gap on its left. This gap was not just in the American lines but in the German defenses as well, if troops could be moved through that gap then something good might happen. The only troops available were the 82nd division, and so they were sent. 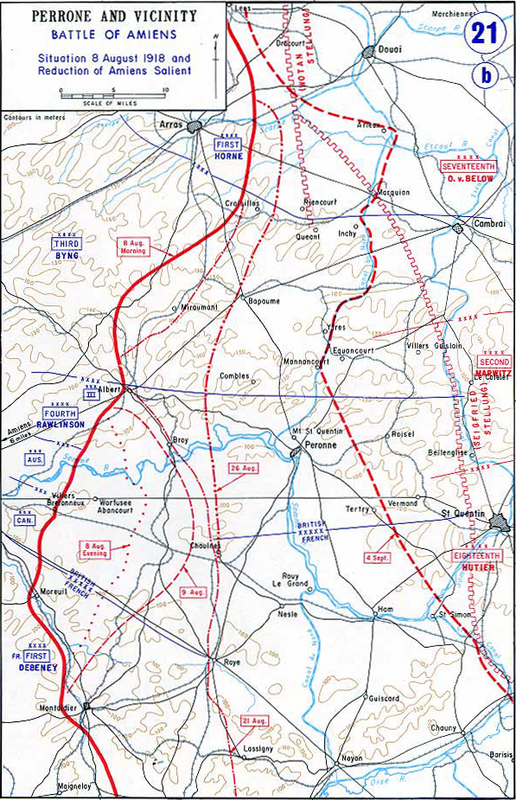 The 82nd at this point was 8 miles behind the front, and if it wanted to meet Liggett's specified start date of early morning on the 7th it would have to cover that distance quickly. Once they arrived they would need to cross the Aire river, over which all of the permanent bridges had been destroyed. Then they would be asked to attack an enemy that nobody knew the strength or dispositions of. Quite the task for a division as inexperienced as the 82nd. It had participated in the St. Mihiel operation, but only a small piece of the division had actually been involved in actual combat. Many had no combat experience at all, and now they were being asked to launch a bold attack. If they could get in place in time and go forward they would be joined by other units all along the front. One of the driving forces behind moving the 82nd into position so quickly was the Lost Battalion that we discussed last episode. There were many efforts to relieve the cut off troops, and this was one of them. If the 82nd was success in its attack the Germans would be forced to abandon their positions around the battalion, and really in the entirety of the lower Argonne. Fortunately during the night before the attack a unit of engineers were able to throw up some temporary bridges over the river for the 82nd to cross, which allowed them to stay together a bit better, and kept them from getting so wet in the crossing. They quickly advanced about a half of a mile and took two important hills, but then their attack began to slow. This was not a good enough advance to fulfill their task of pushing the Germans out of the Argonne, but the 28th division was able to help them out with that. The 28th divsiion's 112th regiment was able, at great cost, to capture Chatel Chenery and HIll 244 from the Germans. This meant that the Germans had a serious problem on their left rear and all of the troops to the south of these positions were very vulnerable. This was a direct contributing factor, along with the attacks by the 82nd, for why the final attacks on the Lost Battalion were so lackluster. Soon the Germans were forced to abandon the entire southern Argonne, and Le Chene Tondu with it. In the center of the American line the attacks continued without much headway being made. General Bullard, in command of the American Third Corps, was simply running out of men. His troops had been in combat for over two weeks, with just a few days rest there at the end of September. Bullard was also not the most imaginative commander. And as morale began to flag within his units he had only one remedy attack, attack, attack. That would fix the situation, obviously, but then it didn't. There was some small progress made, a small hill here, a trench there, but always the German fire from the other bank of the Meuse as well as in front of the troops was just murderous. It would be at this point that the American commanders would fall into a trap that would be very familiar to their French and British allies. They beleived that the enemy was barely holding on. It was true that the Germans were losing men, a lot of men, but they were no where close to as weak as the Americans believed. October 10th would be the point where the Americans were at the height of this folly, which had been present in almost every major battle since the war started. They believed they were so close to victory, they weren't. There were some small successes that were worthy of celebration. On the left Liggett's First Corps now controlled all of the Argonne and the Americans were up to the south bank of the Aire. On the right the 1st Division had advanced the furthest, although they had also taken over 6 thousand casualties. One of the real problems for the Americans, was that at the current rate of attrition even the much lauded American manpower pool was falling short. On the evening of October 9th Pershing would realize that he would need 90,000 replacements to replenish his divisions, but he would only have half that number before the end of October. The lack of reliable transport options was also becoming problematic. Remember back in early 1918 when the Allies had convinced the Americans to prioritze shipping only combat troops to Europe. Well, that meant they had reduced the amount of transportation troops that had been sent to Europe by almost 75%. Those that were available were heavily utilized and after week sof actions some were beginning to break down and they needed relief. Pershing would later say of this time "the period of the battle from October 1st to the 11th involved the heaviest strain on the army and me." Pershing was also getting a lot of pressure from his allies in the middle of October to produce success. Foch would tell Pershing at a meeting on October 13th that “On all other parts of the front the advance was very marked, the Americans were not progressing as rapidly as the others. No more promises! Results! I judge only by the results. … If an attack is well planned and executed, it succeeds with small losses. If not, the losses are heavy and there is no advance.” This is just one example of the unfavourable opinions held about the American army by its allies. Haig would say “The state of chaos the fool [Pershing] has got his troops into down in the Argonne is indescribable.” Clemenceau would be just as critical “the French Army and British Army, without a moment’s respite, have been daily fighting . . . our worthy American allies, who thirst to get into action and who are unanimously acknowledged to be great soldiers, have been marking time ever since their forward jump on the first day; and in spite of heavy losses, they have failed to conquer the ground assigned them as their objective.” The only option available for Pershing was to continue the attack, only success would erase their criticism. One of the changes that Pershing made on October 10th was to change up the exact command structure of the American First Army. Up until this point Pershing was not just running the entire American Expeditionary Force but also the First Army. This gave him an absurd amount of responsibility, an amount that was far beyond the capabilities of a single person. He should have realized this earlier, but it would take all the way until October 10th for him to decide to change things. The change would happen on october 16th when Pershing would relinguish command of the 1st Army and name General Liggett as its new commander. Liggett had done well as commander of his Corps over the last several months, and he was probably the best choice to lead the army. The first Army that he was taking command of had been in combat for weeks, had lost 75,000 men, but it was still going to have to launch more attacks, Pershing demanded it, it would be up to Liggett to make it happen. Even though Pershing had decided on the 10th that he would be giving Liggett command on the 16th the army would not sit idle for 6 days, instead the plan was to continue attaking along the entire front. The Germans were losing men but they still held the strong positions within the Kriemhilde Stellung, and they were clinging to them strongly. Any time the Americans would attack, and often fail, the Germans would lash out with small but repeated counter attacks. One American soldier, Sergeant Major James Block would record of this time that "Under such fire, and in those surroundings, all the sensationalism, all the heroism is removed. The long fatiguing days and nights of patient suffering; the continual exposure to miserable weather such as is found no where else on earth; the horribleness of the whole scene, all tended to deaden one’s faculties. Men moved about like mere machines. No man could rest in that cold and mud with gun fire for a lullaby. As one by one (sometimes two or three at a time) we saw our pals “go west,” we resigned ourselves to fate, and patiently waited our turn. If the end would only come quickly when it did come. But no, we linger on, passively enduring what seemed certain death. But it was not the fear of death, so much as the fact that we were suffering the tortures of a living death, unable from our support positions to strike back at the foe." On October 14th the next major effort would begin, and the American attack would begin at 8:30. This was later than the normal kick off time for American attack, and it was hoped that this change woul reduce the effectiveness and preparedness of the German defenses, it didn't. Once again the Americans threw themselves at the German defenses, experienced heavy losses, and while they did manage to push the Germans out of a few positions, many units were completely wrekced by the fighting. An example of the state of the units at the front by this point was the 82nd division which in less than a week of fighting had lost two-thirds of its original strength, and still Pershing wanted to continue attacking. Pershing would hand over the reins to the First Army on October 16th, Liggett had only learned of this plan 4 days beforehand. Over the course of those four days he would spend time touring as much of the front line as possible. He wanted to know the situation along the front and to know the general mindset of the troops and commanders. Along the way he would listen and then return to his headquarters to determine the best path forward. During this time he discovered some very discouraging information, the first army was in a bad place. It still had, on paper, over a million soldiers. But 100,000 of those were not with their units, they were either lost of purposefully wandering aroun behind the front. The fact that so many were straggling behind did not bode well for the overall state of morale in the army. Confidence was also hard to come by and the troops were also lacking that confidence and aggressiveness with which they had started the Meuse-Argonne operation. Liggett thought that he had at least one easy way to try and turn all of this around "I believe it would be well to insist that division, brigade and regimental commanders visit daily all of their lower units and gain more personal contact with the men. There is no question in my mind that the spirit exists to soundly thrash the German in our next attack. This spirit can be made use of if our officers will only appear more frequently among the men with the firm conviction of thrashing the German in the next attack." Along with targetting the spirit of the troops, Liggett also wanted to instill a new plan for actually fighting, he wanted to move away from masses of men pushing forward in front assaults and try to move closer to the current European model of fire, movement, and small unit tactics. Many veteran American units had already started making this transition on their own, utilizing fire and movmeent and infiltration to try and prevne the wholesale slaughter wrought by German machine guns. However since these tactics were not instilled from the top down it was hard to keep this hard won intelligence and adaptation in place with so many raw replacements being pushed into the ranks. Liggett also reinforced the military police behind the lines to try and round up as many stragglers as possible and to get them back to their units. Liggett would take some time to implement all of these changes and to lay the groundwork for his attack. And this whole time Pershing would continue to push him to start attacking again. Liggett would resist this for two weeks insisting that the entire army had to be ready for one united blow, only then could it find success. Liggett eventually set the date for October 28th, but he was soon asked to delay it to November 1st by the commander of the French 4th Army which would join in the attack. In his personal account of this delay Liggett was actually quite pleased, he could blame the delay on the French, and there were always more things that he could do to prepare for the attack. The plan for this attack was for the primary thrust to come from the Vth Corps in the center of the First Army front. The objectives were mostly the same things that the Americans had been pursuing since September. This would however be the largest attack since September 26th, so it was hoped that it would make at least some progress. It was scheduled to begin at 5:30AM. On the first day the troops on the left made little progress, just like in previous efforts. Here the commander of the First corps was greatly disappointed, but Liggett was more optimistic and would say that there would “be no enemy in front of that corps the next day, as the advance in the center would force the German to go north, and to go fast.” Liggett was absolutely correct in this evaluation. In the center of the attack the V Corps had done quite well, and the Germans had been forced to leave the rest of the Kriemhilde Stellung behind and to retreat to a far less impressive set of fortifications behind it. The next day the First Corps would advance the furthest of any American troops, penetrating as much as 6 miles. Things were finally opening up for the Americans. On the German side, things were looking very much the opposite. Gallwitz would write after the war that “I clearly saw that the situation could be ameliorated only by counter attacking and throwing the enemy back across the river. I lacked artillery enough for such an undertaking, to say nothing of infantry for actual execution of such a plan. All that was left for me, under these circumstances, was to continue to hold out as long as I could.” By November 4th the Americans had advanced 13 miles, and the German defense had essentially fallen apart. Pershing hoped that the new found success would carry his troops all the way to Sedan, and the advance continued in that direction. On November 9th Foch wired a message to Pershing that read "The enemy disorganized by our repeated attacks is withdrawing along the whole front. It is important to maintain and hasten our action. I appeal to the energy and initiative of Commanders-in-Chief and their armies to secure decisive results." At this point Foch would have known that an armistice was going to be signed soon, but he wanted as much ground as possible captured before a possible end to the war was agreed upon. On November 10th the American attacks would continue, and it would be a race to the finish. Join me next episode as we take a step back in tiem and catch up the rest of the Western Front to this point on November 10th, the day before the last day of the war.